Hours Open for dinner Wed.- Sat. 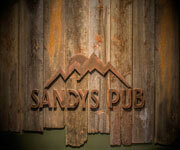 Features: Six Peaks Grille offers fresh and innovative food prepared with distinctive regional ingredients. 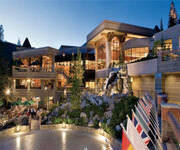 Guests can enjoy spectacular views of Squaw Valley, while sipping on one of Six Peaks Grille's signature cocktails. 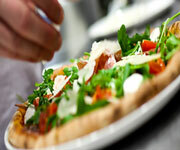 Open year-round, you won't want to miss the chef's thoughtfully prepared menu. Why We Dine: The breathtaking views of Squaw Valley and sustainable food make Six Peaks Grille a top choice for fine dining. The Views: Floor-to-ceiling windows overlook the Squaw Valley meadow. Dine al fresco on the bistro patio in the summer, or enjoy the warm fireplace year-round. The Food: The current menu at this Lake Tahoe favorite highlights Northern California ingredients. 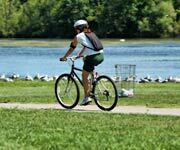 Try local cheeses, meats from The Sausage Factory and Sierra Meats, and chicken and lamb from Petaluma Poultry. The Martinis: Six Peaks Grille is known for its signature cocktails and martinis. Inside Knowledge: Look for spoon icons on the menu to spot local favorites. Bone-in Pork Chop: Six Peaks Grill uses local pecan and apple wood to grill this woodfired 10-ounce heritage pork chop. The menu promises "the aroma of Tahoe in every bite." Granite Chief: This specialty martini combines Bulleit rye bourbon with fresh lemon and orange juice. Topped with a splash of ginger beer and rimmed with a touch of raw sugar. Open for dinner Wed.- Sat. 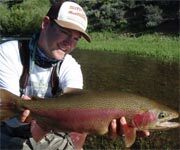 Six Peaks Grille strives to offer sustainable and local meats, seafood, and produce. The bistro patio has floor-to-ceiling windows that overlook Squaw Valley, providing breathtaking views in the summer. 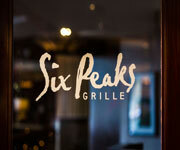 Grab a signature Six Peaks Grille martini or choose one of its other well-known signature cocktails. 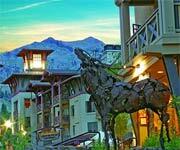 The Resort at Squaw Creek provides gorgeous luxury lodging accommodations in Lake Tahoe. 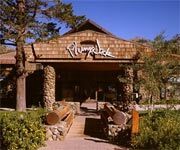 Located in Olympic Valley, this upscale option among popular Lake Tahoe hotels has many amenities that contribute to memorable stays and lifelong memories. 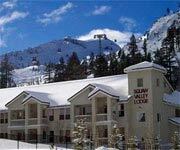 The Squaw Creek Resort provides convenient ski in and ski out access for winter sports lovers and a champion golf course for golfers. Other amenities include an outdoor heated swimming pool, slide, a luxury spa with massage and facial services, and great gym facilities.